Bertolli Gourmet Frozen Meals Review and Giveaway!! After a long day of work-be it household chores and taking care of the children, or a regular "job"-the last thing you want to do is fuss over a meal, right? And yet, you want the best for your family. A home cooked meal, not fast food. Real ingredients, not artificial ingredients that taste...well...artificial! If this is a conundrum you're familiar with, then I must bring something to your attention. Bertolli Frozen Meals! Before you stop reading and ask how on earth I can consider a frozen meal to be a good substitute for home-cooked on those busy days we all have, please just keep reading and you'll discover I am justified in this claim. I received coupons to try Bertolli's 2 newest Risotto meals and 2 soups. These are: Garlic Shrimp Risotto, Roasted Chicken Risotto, Italian Wedding Style Soup, and Ricotta and Lobster Ravioli in Seafood Bisque. After getting all these delicious meals back to the house, I cooked up the Roasted Chicken Risotto for the 2 of us who were home for dinner that evening. I was surprised to see that the sauce is frozen into chunks; these thaw and turn into a rich, creamy sauce during cooking. It only takes 10-12 minutes to turn this bag of frozen ingredients into a steaming hot, very appetizing meal for 2. Strips of chicken are paired with mushrooms, asparagus and Italian rice. All blended together in a parmesan cream cheese sauce. This is absolutely delicious, and is my favorite out of the meals. The second meal I tried was the Italian Wedding Style Soup. Again, I was surprised and impressed with the made-from-scratch-at-home flavor! Mini meatballs, spinach, bacon pieces, carrots and ditalini pasta float in a rich, savory broth. While I'm not much of a soup person (if it's not tomato basil or broccoli and cheese, I usually won't have very much) the 2 of us polished off the entire pot of soup in one sitting! I haven't yet tried the other 2 Bertolli meals, but I am sure they will be just as delightful as the rest. These have been added to my grocery list for future shopping trips! 2 of my readers will each win 2 coupons for free Bertolli Frozen Meals!! A few weeks ago, I had a first. I went "shopping" for a perfume online! I know some people do this quite often, but for me, a perfume-something you purchase based on the scent-is one thing I have always shopped for in-store. It just makes sense, right? Well, after my great experience with Escentual.com, I am having to rethink my philosophy! I was able to choose a fragrance from Escentual.com for my review. It took some time of reading not only the description, but also some user reviews, to finally make a choice. I wanted a fragrance that would last, yet not be overpowering. Something not too flowery, yet not too musky either. Not too girly, but still feminine. After checking out many different options, I settled on the Roberto Cavalli Eau de Parfum Spray. When the package arrived, I was very impressed with the EDP bottle. I know packaging isn't everything, but it is something. When care is taken to make the bottle look nice, chances are the same (or greater) care is taken to get the fragrance just right. 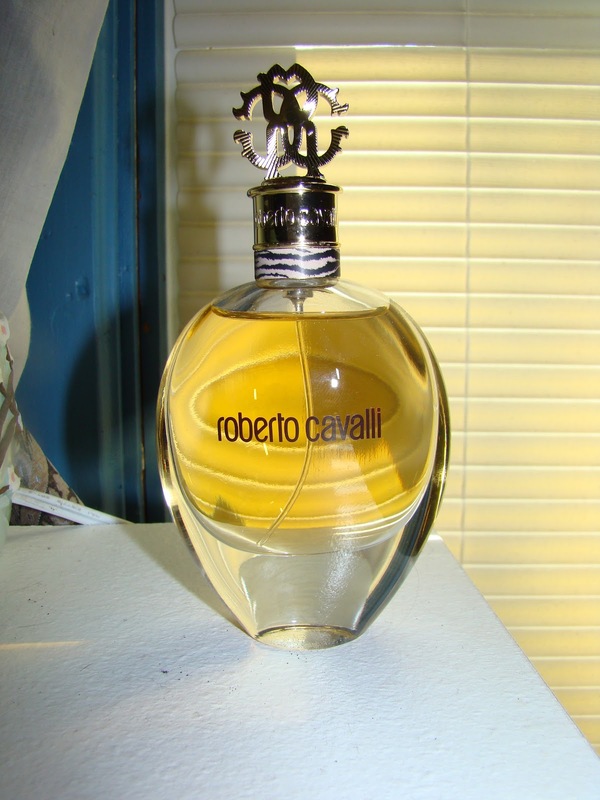 The Roberto Cavalli EDP comes in a lovely glass bottle, with a nice eye-catching "lid". Moving beyond what you see, I tried a spritz of the perfume right away. Wow! Not only did I end up with a fragrance that is exactly what I was looking for, but Escentual.com did an amazing job of describing the scent, the notes, and the overall "air" of the Roberto Cavalli EDP! And, to top it all off-this fragrance really does last all day. A spray on the wrists and throat in the morning, and I can enjoy the beautiful scent all day. Definitely a winner! "Indulge in wild and luxurious sensuality with the Roberto Cavalli Eau de Parfum, an intense floral oriental fragrance that won't let you go unnoticed. Roberto Cavalli couture is all about excess, confidence and seduction. His flagship fragrance captures that same allure, with seductive floral notes, velvety fruits, and a caramelised dry down. Base Notes: Roasted Tonka Beans, Benzoin Laos"
Escentual.com has an extensive line of fragrances, so no matter what you're looking for in a perfume-you can find it here! A new bottle of Eau de Parfum would make a wonderful gift for the holidays, so be sure to check out Escentual.com today! Disclaimer: I was not monetarily compensated in any way for this review; I did receive product for the purpose of review. All thoughts and opinions are mine; all quotes taken from the Escentual.com website. I was not required to post favorably about the product or company. Punkeelove Headbands Review and Giveaway!! Lately I've been changing my hairstyles, trying to find something different that is still functional, yet a little more stylish than my normal ponytail or braid. One option that I really love, because it keeps my hair out of my face yet allows it to actually be loose, is simply sliding in a headband. 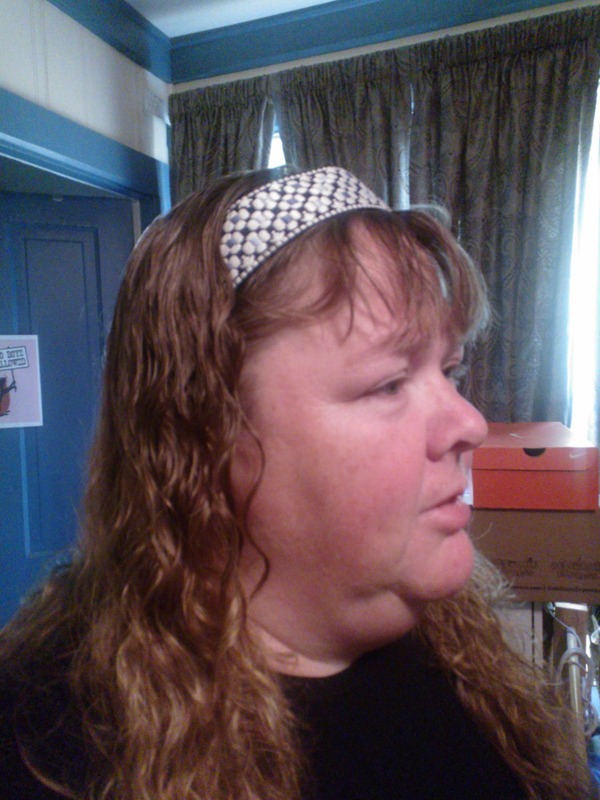 Not just any headband though; I absolutely can NOT wear the typical plastic headband, or even the cloth bands. Maybe I have an odd shaped head or something, but they're always falling out! So, when I received a fancy new headband from Punkeelove Headbands, I was excited to try it out. 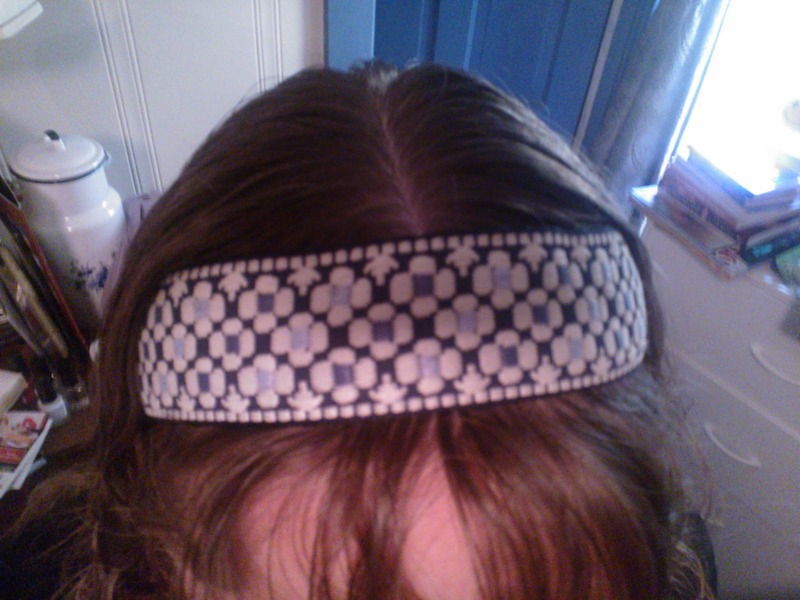 Punkeelove sent me the Hopscotch Blue Headband, which is one of their wider bands, at 1.5 inches. The colors in this piece are very pretty, and being my favorite color, it matches over half of my wardrobe! The headband is made with a velvet lining, which gives a comfortable fit and, most importantly, prevents the slipping that is so common when wearing headbands. Additionally, the Punkeelove headband is almost completely material-the adjustable elastic is a very small part of the band, so you have very minimal slipping. By minimal, I mean that I can wear this headband all day, during workout, sports, and normal household chores, and only have to adjust it a couple times throughout the entire day. 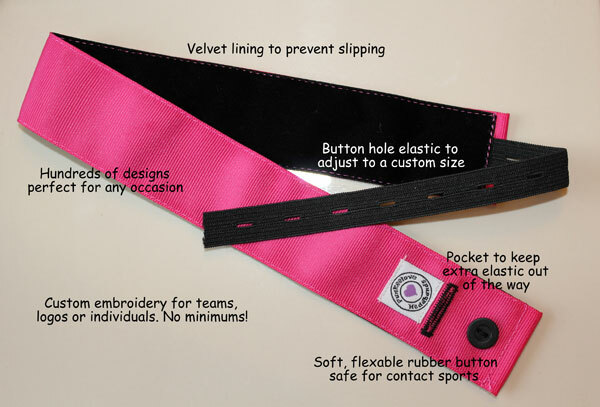 Another thing that makes Punkeelove Headbands unique is the button adjusting system. Instead of just a strip of elastic, these feature buttons to make them completely adjustable to whatever size you need. They provide a more secure fit, too! 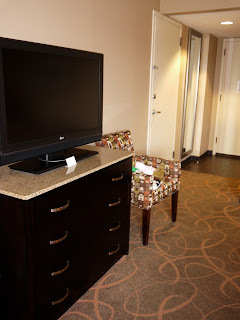 Our Visit to Hilton DoubleTree Austin! Recently our family took a trip to Austin, Texas. One of my favorite states to visit! Everyone was excited about this trip though, because we were staying at the DoubleTree by Hilton while in Austin! 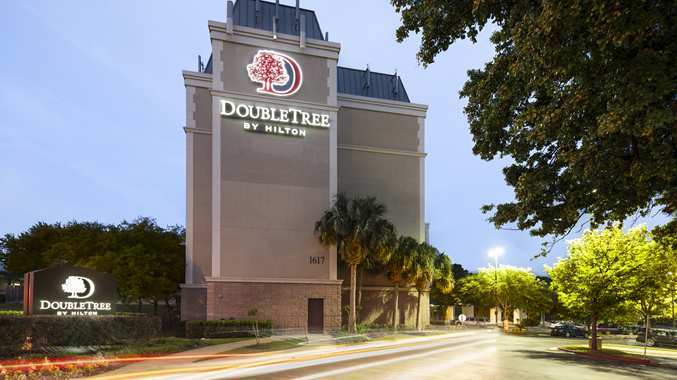 The DoubleTree is located in northern Austin, pretty close to the University. It is in a very quiet area though, so don't let the idea of a University nearby scare you. Checking in was a very smooth process, and we were welcomed very cordially by the front desk staff. At check-in, we were presented with some cookies. Not just cookies either-4 chocolate chip cookies that were still warm! Nice and fresh, and very much enjoyed by the family. Our room was on the 6th floor, which the children really enjoyed. (Why do heights always impress children?). This made looking out the window one of their favorite activities during our visit! The room itself was very nice, and the decor was perfect. I know it's not the most important aspect of a hotel, but I much prefer staying somewhere with a tasteful decor, rather than the bold, clashing colors I've seen at a few places! The dark wood was lightened by a brighter carpet and bedspreads. In addition to the beds, our room had a chair, dresser, and a nice L-shaped desk. One side of this was perfect for computer work, and the other side holds a coffee maker. This is a little more of a gourmet coffee machine, rather than the standard piece you find in most hotel rooms. As coffee is one of my weaknesses, having this in the room was very nice! 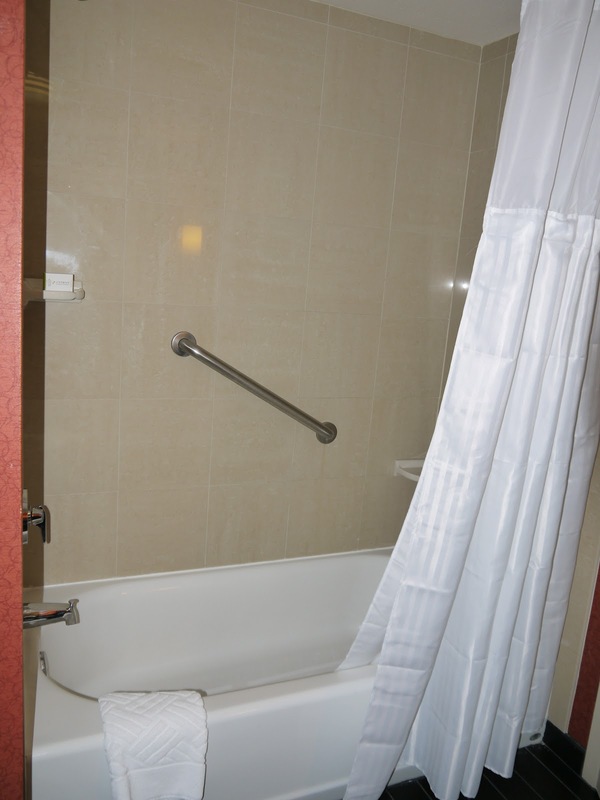 As you can see by the pictures, the DoubleTree by Hilton in Austin, TX is a great place to stay. Whether you're traveling for business or pleasure, vacationing with the family, attending a conference, or visiting someone at the local University, the DoubleTree is the perfect place to stay! If you're not planning a visit to Austin anytime soon though, don't worry. DoubleTree by Hilton has locations all over the US, so reserve your room today! Disclaimer: I was not monetarily compensated in any way for this review. I did receive 2 free nights lodging for my review. I was not required to post favorably about the hotel; all thoughts and opinions are mine. Barcodes are on practically everything a consumer buys. From books to cereal, they allow businesses to run effectively and efficiently with a high level of organization. If you're looking to save time and money for your business, read on! The following tips will give you the ideas and tactics necessary for a successful business model using barcodes. Have you ever heard of IT assets and fixed assets? IT assets are the elements in a business such as software and hardware where as fixed assets can include property that cannot be converted easily to cash. Regardless of size, every business has these two types of assets. In order to save time and improve efficiency, a business owner should consider implementing a basic asset tracking system. Keeping track of each asset with barcoded asset tags can be scanned to check items in or out in your company's asset tracking software. This is an excellent way to improve accountability and it also makes audits significantly easier, making your life easier in the long run. By using barcodes to track your business' inventory, this method can help you stay up to speed in terms of where items in your inventory are located and how many of those items are in stock. Barcode labels allow you to have the freedom of removing a specific item from stock and scanning the barcode to keep an available count in your inventory tracking software. This reduces the time it would take to manually track your inventory using methods such as spreadsheets or SKU. Hosting an event or party can be time consuming enough without the hassle of tracking RSVP's and trying to read your attendee's handwriting. Think back to those times when you've thrown an event and spent hours at your desk checking off names on a list based on who's responded yes and no. Now think of how much easier it would be if you added barcodes to RSVP's. This approach would allow you to track who has responded to your invitation in a stress free and organized manner. If you send out invoices to customers, stay tuned because this tip is for you. By adding a barcode that represents the customer's number or the individual invoice number, you'll have the convenience of easily locating the customer account number or invoice number when the payment is returned. This method prevents problems like applying payments to the incorrect customer account or invoice. Barcodes are practically everywhere, but it's challenging when it comes to putting them on small items such as screws and nails or perishable items like green beans and cabbage. While some of the smaller items come in bulk packages, buying these items individually without barcodes can slow down check out lines and make a store clerks job extremely difficult. In order to keep moving forward and keep the check out line moving, it's important that businesses consider using a shadow book or barcode scan sheet. This list has corresponding barcodes so that when you're approached with something that doesn't have a barcode, you can look it up on the scan sheet instantly to reduce time and increase productivity. Barcodes add a whole new level of convenience and satisfaction for business owners struggling to keep everything organized. Having a central code that corresponds with a product in a database allows a business to run much more efficiently than if you were to look everything up manually. Follow these tips and your business will be smooth sailing in no time! 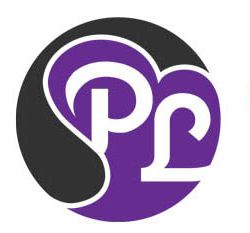 Patricia Goldbum is a business owner looking for the most efficient ways to run her business. Just recently, she implemented Camcode hanging signs in her business' warehouse to improve organization and efficiency. 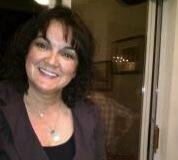 She is always striving for perfection with her business and hopes to help her readers do the same! 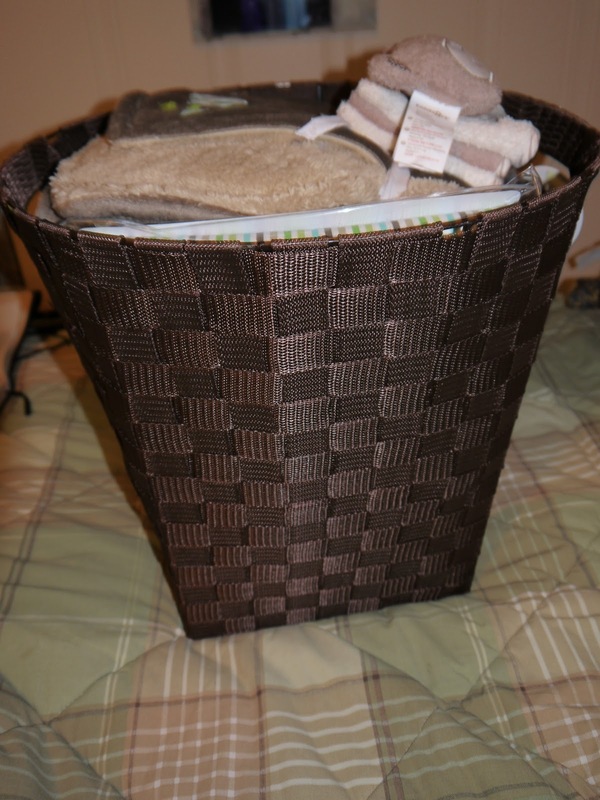 Babies "R" Us Basket Review and Giveaway!! 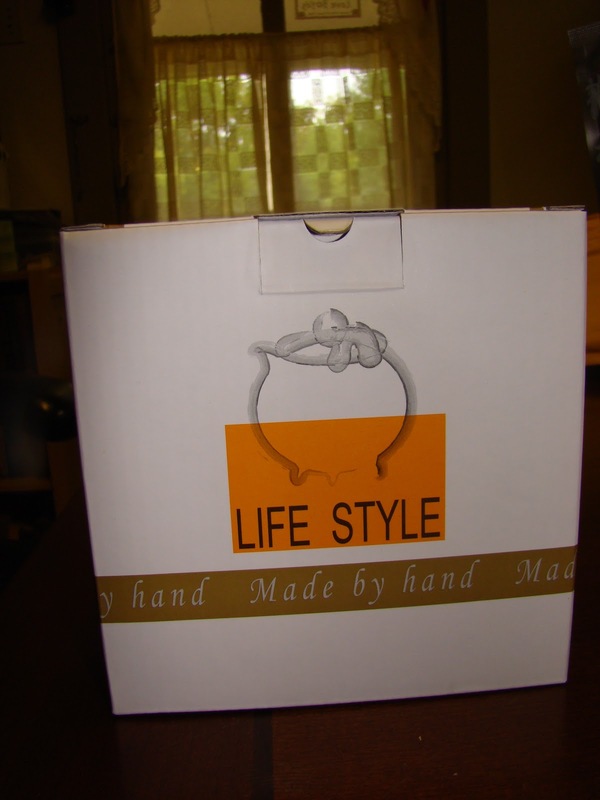 Babies"R"Us recently expanded their line of wonderful baby products, and guess what? They sent me a basket full of goodies to check out the new additions! I received a huge box at my front door, and couldn't wait to see what was inside. I opened it up to find a nice storage tote filled to the brim with Babies"R"Us products. I was seriously amazed at all the cute items they were able to pack into this basket tote! Here goes: 1 Crib Sheet, 1 box Rice Cereal, 1 Little Wheels, 1 Little Munchers, 1 Apple Puffs, 1 Strawberry Puffs, 2 Yogurt Bite packs, 4 Food Pouches, 4-pack Receiving Blankets, 2-pack Receiving Blankets, 1 Chamois Baby Blanket, and 3 items from the new and adorable B is For Bear collection-1 Supertowel, 1 Hooded Towel, and 1 Wash Cloth Set. Needless to say, this is a great sample of the new products from Babies"R"Us. And after seeing them for myself, I am so impressed! The chamois baby blanket is absolutely the softest blanket I have ever felt. This would be so comfortable and cozy for a baby! The hooded towel, though, is my favorite. A cute little teddy bear sits atop the hood, and it even comes with a wash mitt. The towels and washcloths are also really soft, so they won't irritate baby's skin. The best part is, all these products are gender-neutral. So whether you're having a boy, girl, or don't want to know until the birth-you can still be prepared with the products from Babies"R"Us! These would also be great ideas for a baby shower or a holiday gift for that little infant, so keep them in mind for the holidays too! One of my readers will receive a Crib Sheet and 2 packs of Yogurt Bites!! Recently the subject of portable solar panels was brought up. This is something I have actually considered for a number of reasons. I love camping, and it's something we try to do at least a couple times a year. Usually tent camping, but sometimes we'll opt for a rustic style cabin, which often don't have electrical outlets. And, while I love "roughing it" for a weekend or even a week, there are a few things I can't do without. I can adapt to cooking over an open fire or a grill. I can do with running up to a bathhouse in the middle of the night when one of the children needs a bathroom. I can even do with cold showers if there's no hot water. But, I have this need for a couple tech gadgets that I've never tried going without for even a weekend. Yep, my cellphone and my iPod. I need to be able to reach my family and/or friends if something comes up, and although it's not quite to the point of being called a need, I really like having some music to listen to at night. Of course, that means bringing along portable speakers as well, and while it's pretty easy to find a set that runs off your iPod battery, it also means the iPod doesn't last as long. So, for those occasions when we're tenting, or staying in a bare cabin, I thought a portable solar panel would be perfect. See, more than just an extra battery for the tech devices, a portable solar panel would allow me to charge multiple devices. Over and over. It's not a single charge, but, because it's solar powered, I could re-charge my phone and iPod as many times as needed. The panel gets it's power from the sun, and converts that into a charge for any and all of my tech devices! There are many sizes and styles available, from a little panel to something that can actually be installed (at your home or a permanent camp) for a permanent solution to your battery charging needs! This is definitely something I will be researching further! This is a sponsored post for Goal Zero, however, all the points and views are my own. How many of you use lanyards? While I don't really use a lanyard on a regular basis, there are many times throughout the year that I end up needing one. Whether it's at an event and I use it to wear my name tag or ticket, or maybe carry an important paper. Earlier this year my sister and I attended a 3-day event, and rather than carrying a ticket around all day, 3 days in a row, I chose to wear my "ticket" around my neck with-you guessed it-a lanyard. So much easier, and no chance of dropping my ticket or losing it in my purse! Even if you don't have a company, product or website that you want to promote, custom lanyards are still something you might be interested in. They would make a great souvenir or keepsake for a family reunion, or a group trip. It would be wonderful for putting the family name, a group motto, or that special date. Perfect for children's clubs or groups, too. An easy way to keep track of children on an outing, or a tool so the children can carry money or tickets while out and about. Lanyards are a great way to carry those little necessities while traveling or at events. What about you? Do you have any special use for lanyards? I am loving all the ways you can utilize these handy little straps! Carrying keys, cash, cards, passport...what else do you carry with or on your lanyard? This is a sponsored post for Namify, however, all the points and views are my own. Many years ago our family was moving from one state to another. A pretty long trip, but that didn't bother us, as we do enjoy (and always have enjoyed) traveling together. What made this moving trip different is the fact that rather than pulling a U-Haul or similar trailer, we were using a very large cargo trailer. A large red trailer, quite a sight being towed behind our family vehicle! Of course, no road trip is without a mishap it seems. If you've done any extensive traveling, I'm sure you know what I mean! We not only blew a tire, but ended up damaging the axle. Pretty badly, too. That meant only one thing-a call to AAA, requesting a tow truck. Unfortunately, we were in a pretty small town. It's not like we needed towing San Jose! No, we were in a rather rural area, with pretty limited towing capabilities. Thankfully, after many calls, and a very long wait, we ended up with a towing service that could do the job. Only, they didn't actually tow our trailer. Due to the damaged axle, they had to put our trailer on a flatbed truck and transport it to the repair shop. Yep, leave it to us to cause such a ruckus by needing something more than the average tow truck! Needless to say, we were quite anxious as we watched that old red trailer, with all our possessions, being loaded onto a flatbed. It was very well secured and locked into place, but following the flatbed-and our trailer-to the repair shop, we were able to see each sway and move as the vehicle turned, stopped and accelerated. Not a very reassuring sight! However unstable it appeared to be though, our trailer and all it's precious cargo made it safely to the shop. We ended up needing a hotel stay for that night, but were able to start out bright and early the next morning. Complete with a newly repaired axle, and a smoothly running rig! It is one of our traveling experiences that, although it was pretty serious at the time, now we can laugh about it! This is a sponsored post for D & M Towing and Transport, however, all the points and views are my own. Vote for Family Foodie at Women Who Shine! Have any of you heard about the Yahoo Women Who Shine program? This is a great site to visit, where you can learn about women who encourage others-whether as a Mom, a teacher, a survivor, etc. You can submit a nomination if you know a woman who is a shining example, and want others to hear about it. Or, you could just vote for a woman on the site. Voting ends next week, and the woman who shines with the most votes will receive a $10,000 prize! If you know someone who shines, I suggest nominating them today. Has your Mom been a shining example? Do you have a friend who has a great community outreach? Do you know someone online who challenges and encourages you? Why not nominate them as a Woman Who Shines?! I learned about it a month or so ago, and actually submitted a "Woman who Shines" on the site. My nominee is Isabel Laessig, and she shines in an area very close to my heart-family dinnertime! Check out Isabel's page on Shine, and please consider voting for Isabel in this program! If you want to know more before voting, then read on! Isabel Laessig is a mom on a mission-bring back home cooked meals and family time around the supper table! It seems like many families now eat their meals in different rooms, or just a grab a bite on-the-go. So, Isabel, a mother of 4, decided to work at changing that routine. Her mission began when her oldest daughter, Alexandra, was headed off to college. Alexandra was asked what she would miss most, and replied that she would miss dinner, and the family table talk that accompanied the meal. This started Isabel thinking about the importance of family dinners and quality time spent together around the table. She soon started a blog, Family Foodie, where she shared meal ideas and recipes, as well as encouragement to eat dinner together! From small beginnings, Family Foodie is now the base for a group of mom bloggers who are also passionate about bringing back Sunday Supper, and boasts over 1.5 million followers! Every Sunday evening-before sitting down for a family dinner-Isabel joins her followers on Twitter, using the #SundaySupper hashtag. During this time, participants can share recipes, tips, ask questions, and more. All designed to bring your family back to the dinner table! Isabel is certainly a woman who shines, and since cooking and family mealtime are both very important to me, I was happy to get the opportunity to share her passion with others. Please vote for Isabel at Yahoo Women Who Shine today! I was compensated for this blog post while participating in the SocialMoms blogging program. The opinions and ideas expressed here are my own. To read more posts on this topic, click here. Jon Josef Stylish Shoes-Review and Giveaway!! Most women love shoes. Although I don't have a large collection like some of my friends, I do like finding new shoes that fit my style, and give a comfortable wear. When I discovered Jon Josef, I knew I had found a wonderful company for shoes! "Jon Josef is built on the notion that every woman should be able to embrace the ability to work, live and play comfortably without sacrificing style. Our goal is to create fashion forward, contemporary, and flirty shoes of unmatched quality and comfort. Made in Spain and at very accessible price points, women who want to wear Jon Josef shoes don’t have break the bank to get in them, nor hail a cab after 5 blocks after they are." Jon Josef sent me their Belgian Loafers in Black Leather for review. With an understated elegance, these are perfect for dressy events, or for those times you want to go casual chic. You know, pairing denim with a dressy top...I love that look! Anyways, these Belgian Loafers look great either way. The toe narrows somewhat for a feminine look, and the shoe is topped with a small bow. The uppers and lining are leather, and the best part is the cushioned insole! This provides your feet with luxurious comfort, whether you're on your feet for a couple hours or all day. Although I haven't yet worn them for an all-day event, I honestly couldn't imagine them being anything but comfortable! Jon Josef is sponsoring a great 3-winner giveaway, so listen up! Do any of you have trouble getting your kids to eat wheat bread? Some of ours like it, and some don't. They'll all eat it, but a couple will head for the white bread first chance they get. That's why I was excited to learn about the new Smartwhite for Kids from Wonder bread! While still retaining that soft texture, the new Smartwhite bread is made with no high fructose corn syrup, contains 50 calories per slice, and is made with the fiber of 100% whole wheat bread! It also contains the calcium equivalent to an 8 ounce glass of milk. Now that is something the entire family will enjoy! 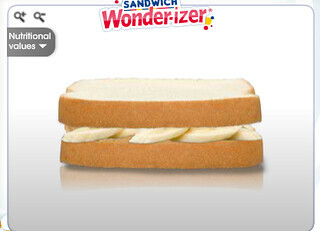 So, while learning about the new Smartwhite bread, I also stumbled onto Wonder's The Sandwich Wonder-izer! Never heard of it? Basically, it's a fun way to create a new sandwich (or make your old favorite) online, and view the entire nutritional value of all your combined ingredients. And, you can also use the "Boost your Intake" feature to see recommended ingredients. Whether you're looking to increase your fiber, calcium, iron or protein, this feature gives you recommended add-ons for your sandwiches! One of my favorite sandwiches-whether lunchtime, or a late-night snack, is the classic peanut butter and banana. Not very original I know, but sometimes the oldies are the best! A slice of bread, lathered with peanut butter (can't go too light on this step), and sliced bananas layered on. Top with another slice of bread, and you have the ultimate sandwich! I "designed" my sandwich on the Wonderizer, and love being able to see the nutritional value for my complete sandwich, rather than trying to compute each ingredient. Super helpful, and kind of fun too! Head on over and make your own sandwich on the Sandwich Wonderizer! Make sure to "like" Wonder on Facebook to stay updated on any news! 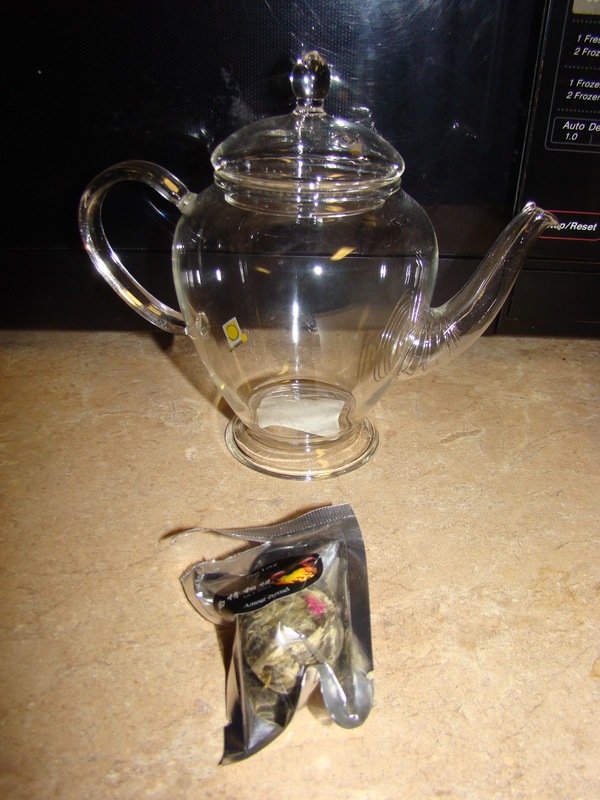 Teavivre Blooming Tea Set Review!! I have to admit, although I am (and always will be) a coffee lover, I am starting to really enjoy hot teas. 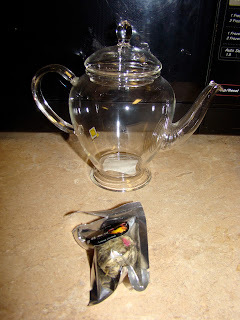 So, I was thrilled when Teavivre sent me the Clear Glass for Flowering Teas, and a sampler of 10 Flowering Teas. If you've never seen, or tasted, flowering teas, you are missing out! I was excited when the Teavivre package arrived, and made myself some flower tea pretty quickly. I chose a tea, and proceeded to boil some water. The tea leaves are actually wrapped tightly into a ball, and looking at it, you'd never expect the beauty or the taste that comes out! Watch the video to actually see the process for yourself, or just check out the following pictures. Don't think that the tea is just a pretty table centerpiece though; it tastes great too! It has a more delicate flavor than the standard black or even green tea, but it is very good. I honestly didn't even need to add sugar, as the flavor was perfect without any added sweetening. So, looking for a unique gift for someone? Or is there a tea lover in your life? Check out Teavivre today! Elite Eye Serum Review and Giveaway!! Haircare by Dr. Boogie-Review and Giveaway!! Monogrammed Gifts from Marley Lilly! Oh Nuts! Gourmet Nuts Review and Giveaway! Paula's Choice Skin Care Review! !